The Yatharagga Satellite Station is owned and maintained by SSC’s Australia-based company SSC Space Australia. The station is operated from the SSC main station in northern Sweden at the Esrange Space Center. The Yatharagga Satellite Station primarily serves government agencies and commercial customers. It includes one 13.56-meter S-band antenna with capabilities for Telemetry Tracking & Command (TT&C) and data downlink services with the capability of providing fast field upgrade with X-band or Ka-band reception capability for future customer needs. The station is well equipped with a very high hot redundancy equipment level and outstanding S-band receives and transmits performance. The entire station, including the antenna system, is fully supported by a UPS power supply system and will therefore not suffer from any power outages during critical supports. The ground station also includes an operational building which houses system electronics and frequency conversion equipment. Space is also available on site to host customer-owned baseband equipment. At the Yatharagga Satellite Station, we have established a new power plant which includes a 300 KVA backup generator and a 125 KVA UPS system. The power system also allows uninterrupted transfer between mains and the backup generator (and back to mains) during planned transfers. This power plant supplies power to both the Yatharagga Satellite Station and the Dongara Australia Satellite Station. 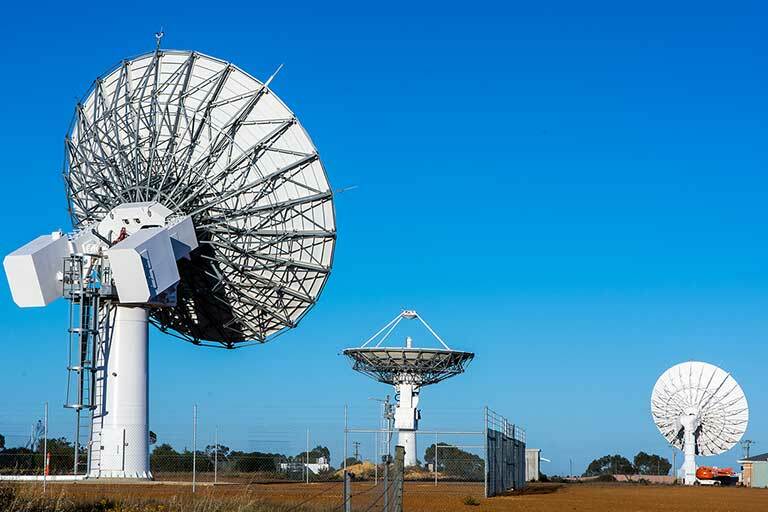 The Yatharagga Satellite Station is located in Western Australia, 29.2º south of the equator, 250 meters above sea level and approximately 400 kilometers northwest of Perth. From this advantageous position, the station provides orbit raising and daily pass support to both polar and low-earth orbiter (LEO) missions. The site’s support capabilities also include geostationary (GEO) orbit raising operations, first acquisition of the launch vehicle and spacecraft telemetry at orbit insertion/deployment. When we use this station in combination with SSC's Punta Arenas station in Chile, unmatched coverage opportunities are available for polar orbiting missions. Together with the Dongara Australia Satellite Station, Yatharagga Satellite Station is part of SSC's GEO orbit raising network, which also includes the Santiago Satellite Station and the South Point Hawaii Satellite Station.